The Mbali Literary Association, essentially a Writers' Club based in the eastern Free State (South Africa) has sent a congratulatory birthday message to African literary giant, Wole Soyinka. Wole Soyinka, a Nigerian writer, was the first African writer to win the Nobel award for literature. His 81st birthday this year is being marked throughout this week globally. Mr George Rampai, General-Secretary of the Mbali Literary Association said that he and members of his Club continue to be inspired by Soyinka. "The man is a colossus, easily one of the best writers in the world," Rampai, a published writer himself said. Rampai continued: "Many of Soyinka's books dot our libraries in the Free state, including the eastern Free state here. I and other members of the club have been tremendously improved by Soyinka's books. 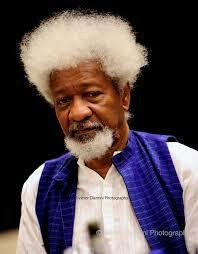 The least we could do was send our heartfelt birthday wishes to Soyinka". Rampai went down memory lane, confessing that in the beginning whilst in secondary school, he could hardly understand Soyinka's works. "I tried to read his novel, The Interpreters, but it was too difficult for me. I kept on reading many parts of the book regularly, struck by the brilliance of diction, African proverbs and idioms etc. Later I read his simpler plays like The lion and the jewel; Brother Jero, which are still very brilliant too. Such books improved me as a potential writer myself,"
In fact George Rampai is now a successful author himself, having published an award-winning novel, From where I stand (2012). "Soyinka is one of the great writers I look up to," he rounded off. "Over the years I introduced his works to other members of the club". One of the male club members of the South African Club said that he loves the works of Soyinka too. "His book that I enjoy most is actually the prose-one, The man died. You can not but admire such an incredibly talented writer who combines uncompromising integrity too,". "Soyinka is one of the major African writers who made us to appreciate South African writers even more," another young woman from the club, said. "Now we can also enjoy reading our own writers like Mongane Wally Serote, Zakes Mda, Lewis Nkosi, Sindiwe Magona, Es'kia Mphahlele among others...we wish Ntatemoholo (Elder)Wole Soyinka a very happy birthday," she said with a beaming, charming smile.